Visitation of the cemetery is allowed from sunrise until sunset and is patrolled by various agencies. At times the Cook County Sheriff's Department may be around or it could be the Cook County Forest Preserve Police. The cemetery is surrounded by a forest preserve, persons on forest preserve land are to be dealt with under the Cook County Forest Preserve Police. If found inside the cemetery itself you would be dealt with under the Cook County Sheriff's Department. Throughout the 1980s to the early 2000s radio communication for the Cook County Sheriff's Department took place on 155.535 MHz and was the best frequency to monitor for Bachelors Grove related radio traffic. Depending upon the mood of the officer, they may follow correct procedure and notify the Cook County Forest Preserve Police if persons are found, for example, walking down the path to the cemetery (forest preserve property). Some violators might only be given a warning and let go. Today, all radio communication for both the Cook County Sheriff's Department and the Cook County Forest Preserve Police go through the Starcom21 system. This system uses a digital method and also incorporates encryption under APCO Project 25 and can not currently be monitored. During peak October night-time visitation to the cemetery some groups of officers would use Nextel cellular phones for surveillance operations. A spotter would camp out in the mid section of the Rubio Woods parking lot and radio back to officers hiding within the cemetery that people were on their way in. When foot traffic is slow the officers would also check out areas of interest such as the house foundations found west of the cemetery. The use of Nextel cellular phones is no longer required to keep the public from monitoring the police unless the officers wish to keep their communications off-the-record and not be officially recorded by their respective agency. 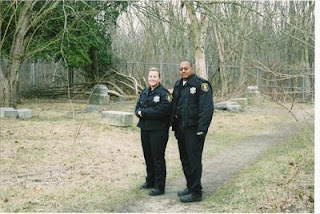 The Sheriff's Department used to park their vehicles south of the cemetery and hike their way in through the "back side" to the cemetery. Out of frustration due to thorn bushes they now park their vehicles near the rear end of the Rubio Woods parking lot and use the trimmed foot path. 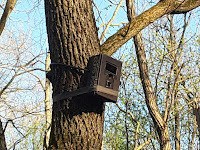 Cameras equipped with a cellular radio link are frequently mounted up in trees to enhance surveillance efforts. These cameras are primarily used for night-time visitor violations and does not reflect upon the legal visitation hours of sunrise until sunset. On many nights throughout the year you can also find one officer randomly parked near the entrance to the Rubio Woods parking lot for about an hour or less at a time. This vantage point allows them to not only witness night time violators use the foot path, but to also clearly notice the flash bulbs firing from cameras within the cemetery as they illuminate the trees around the pond off of 143rd Street. The cemetery is legal to visit from sunrise until sunset. The cemetery and surrounding forest preserves are considered public property. Learn about possible harassment and intimidation tactics carried out by law enforcement while patrolling the area.